Heya everyone! Hope you are well. I'm sorry if this post isn't quite what you have been expecting recently especially as I keep saying I have lots of beauty posts coming up. This is all true however I have been struggling a little bit with the lighting. I just have not been able to get it right which means my photos are either too dark or quite blurry and I'm really unhappy with them. If any one can perhaps give me any advice on how to improve them or anything I can perhaps buy in order to help I would really appreciate it! Just leave your comments below. Now before I go on a rant let me get back to the point of this post. Today I thought that I would do a second 'Share The Love' post. I have already done a post a while ago which you can find HERE and I thought that it was about time I do another one. I absolutely love these types of posts as I come across different bloggers I wouldn't have found otherwise and I think it's quite important to spread the love and just show other bloggers that you absolutely love what they do. So here are some of my favourite reads at the moment. Enjoy! The author behind this blog is the gorgeous Meg and she is just amazing. She is so beautiful and seems like such a lovely girl. Everything from her fashion posts to her photography to her amazing hair are just so beautiful and so amazing. Her blog is one I go too for a little inspiration on fashion and also just to get a little inspiration on her photography too. Lately she has been inspiring so much regarding body confidence and just teaching others to just learn to love the skin they are in. Her blog is an amazing read and so inspiration so definitely head on over to read her blog now. Meg also has a youtube channel and her content is absolutely amazing. You will be able to find links to her youtube on her blog. A blog I have been following for an extremely long time is the absolutely gorgeous Becky's blog 'Milk Bubble Tea'. This is probably my absolute favourite blog. When you come to themed blogs Becky's definitely doesn't spring to mind which isn't a bad thing at all. Becky's blog is extremely varied in content. She blogs about beauty, fashion, lifestyle and just other fun things in general. She is absolutely beautiful and a lovely girl too. I absolutely love reading about her adventures with her boyfriend and seeing cute photos of her puppy who is absolutely adorable. If you don't already follow her then seriously, what are you doing? Click on the link above now to go and check out her beautiful blog. You won't regret it. Since I started to blog Away With The Fairies was one of the first every blogs that I read. I absolutely loved the blog layout and the girl who writes it, Hannah, is so beautiful and absolutely lovely too. I absolutely love Hannah's fashion sense as I find she is a similar size to me and we both have very similar tastes as well so I love going on to her blog and looking for a little bit of inspiration. I also love reading her wishlists and beauty reviews and she is definitely one of the most influential bloggers for me buying beauty products as well so as much as I love her blog I do try to avoid it sometimes haha! On a serious note everything she posts is spot on and she's such a lovely girl so head on over to read her blog now! Pursuit of Felicity is a girl I came across when I first started blogging as I knew she designed Kayleigh (CoutureGirl's) blog and I just wanted to read her blog and find out more about her and I am glad I did. She is a lovely girl and I absolutely love reading her blog and finding out more about how she lives and what she gets up to, especially as she lives in Australia which is one of my dream destinations and I certainly hope to find out more about the country. If you weren't already aware I have recently teamed up with Felicity for a brand new blog design for my own blog. I am extremely unhappy with my design at the moment and Felicity just has a wide range of designs that I absolutely love. I cannot wait to see the finished product. All her designs are amazing and her prices very reasonable. 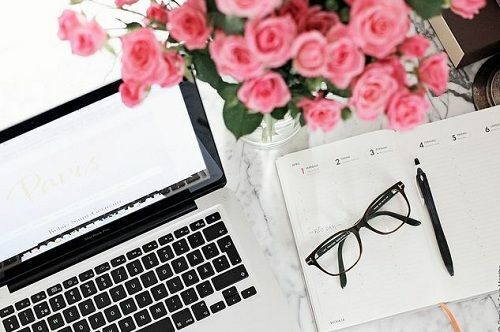 She an extremely lovely girl and makes sure that you are 100% happy with what she comes up with so if you are looking to spruce up your blog I'd definitely head on over to check out her blog and design work. Another blog I really enjoy reading is the gorgeous Amelia's. I have been following Amelia on twitter for the past 2-3 years now and have spoken to her quite a bit and she is such a lovely girl. I've loved talking to her about our struggles as well as our successes and just about life in general. We tend to have similar interests and very similar opinions on certain things and I absolutely love that. Her blog is definitely one of my favourites in terms of content. I love reading about her favourite beauty buys and beauty tips as I've found them super helpful. If you would like to read her blog then head on over now. The absolutely beautiful Jessica is the creative author behind Copper Garden. I've been following her blog for about a year now and the one thing I absolutely love about her blog is the name of it. Copper Garden. I just think it is incredible unusual and definitely sets her apart. I haven't spoken to Jessica much at all but I just absolutely love reading her blog. When it comes to fashion I am definitely not the best person to go to for advice but reading Jessica's blog I've learned many different fashion tips and I absolutely love looking through her lookbook and seeing how to team up different clothes. If you prefer fashion blogs over beauty then definitely check out Jessica's. I absolutely love it. So there we have it. Six of my absolute favourite bloggers at the moment. All these bloggers have taught me so much and I am so glad I came across them as they are all absolutely lovely girls. If you have any other blog recommendations then please leave their names in the comments section below and I will happily check them out! Hope you all have a lovely Friday evening!